This Post has already been read 1169 times. 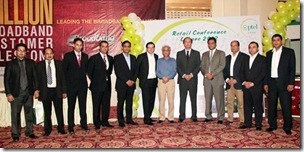 PTCL held a Retailers Conference 2012 in Lahore, which was attended by a large number of PTCL’s retailers, business partners and national distributors. PTCL SEVP Commercial, Naveed Saeed; SEVP Business Zone Centeral, Jamal Abdalla Saleem Hussain Al Suwaidi; and other senior PTCL officials lso participated in the event held at a local hotel. Comprised of team-building sessions, the conference gave participants an exciting opportunity to share observations, experience and successes regarding PTCL’s product sales & services, initiatives & promtions, and distribution & revenue streams. A lucky draw for EVO Nitro, Evodriod and bumper prize of EVO TAB was held amid cheers of retailers, and gift hampers were also distributed. In addition, a signature all and media wall was created to register participants feedback and comments.